It's Facebook Fridays! for January 2, 2015 and due to many requests, we are reprising our most-popular giveaway of 2014, the Big Book Package! 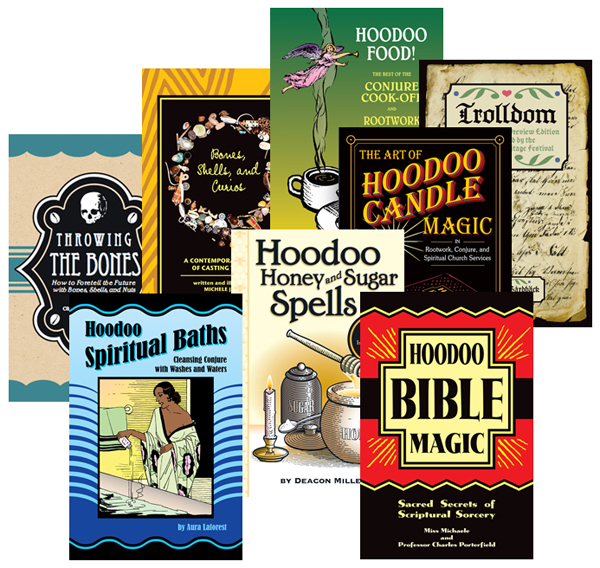 The Lucky Mojo Curio Co. is hosting a random drawing this week to give away ONE magnificent prize box containing eight 96-page instructional books on magic spells, divination, and spiritual practices. This week the prize is one copy each of "The Art of Hoodoo Candle Magic" by Catherine Yronwode, and Mikhail Strabo, "Hoodoo Honey and Sugar Spells" by Deacon Millett, "Hoodoo Bible Magic" by Miss Michaele and Professor Charles Porterfield, "Hoodoo Spiritual Baths" by Aura Laforest, "Hoodoo Food: The Best of the Conjure Cook-Off and Rootwork Recipe Round-Up" edited by Robin Petersen, "Throwing The Bones" by Catherine Yronwode, "Bones, Shells, and Curios" by Michelle Jackson, and "Trolldom Preview Edition" by Johannes Gardback -- a metaphysical mini-library that will educate, enthrall, and elucidate the practices of rootwork, conjure, and world-wide folk magic. First thing tomorrow morning, we will select ONE BIG WINNER at random, announce their name here, and ask them to message this Facebook Page with their mailing address, so we can send them their FREE Literature Package! We have a winner! In fact, we have ONE lucky winner! Our Facebook Fridays! winner for January 2, 2015 is: Tosha Pinkie Askew.